Review: Inuk / It's Just Movies Review: "Inuk"
This is a film about loss and the road to recovery in a frozen land where the harsh environment serves as a keen metaphor to life’s challenges. It is also about the power of human relationships – and how, like the icy hand of the frozen north, they can be more deadly than the cruelest cold. Anderson: It also is a universal story of troubled people in dysfunctional broken families. It is a story of deep pain along with a hope for healing. 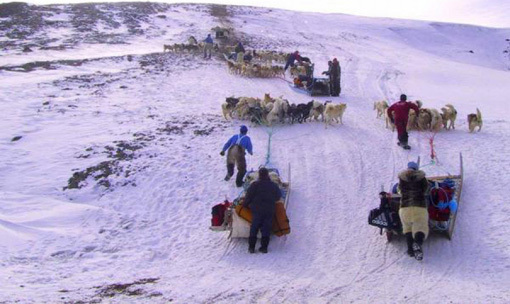 At the same time “Inuk” also gives us dazzling scenery with beautiful snow landscapes, awesome dog sled scenes and views of the far north cities of Greenland. I loved that. The Inuits of Greenland believe that everything, animal, plant and stone, has a spirit. They believe that if your mind is in harmony with the outside world you will never go hungry. This sets the stage for the story of “Inuk,” a physical and metaphysical journey with obstacles of the land, mind and heart to be battled. Anderson: In the beginning Inuk is a small child being carted in a sled with his mother and father. His father is lost when he checks a particular patch of ice for firmness. The rest of the film deals with the aftermath of this crisis when Inuk reaches his teenage years. His mother has apparently relocated with him to a big city. He hangs out with friends, but his interests are limited to their band and continual music. Inuk is careless about his personal health and safety, not dressing properly for the freezing climate. Though we see modern normal families eating, laughing and talking together, there doesn’t seem to be any place for Inuk as he wonders around in the cold. Questad: The city seems to act as that proverbial irony – an isolating place where there are people but no connections. Questad: You and I have talked about sometimes feeling more lonely surrounded by people than when we are actively involved in projects that are meaningful to us. While Inuk searches for food, there is really nothing to nourish his greater hunger for connection. Without a purpose or goal, Inuk is failing to survive. Anderson: His mother declares she is able to take care of her son, but why doesn’t she? She has passed on to her son the ancient art of carving and the stories that go along with it. Her most important gift was his father’s dogsled whip. Both of these gifts, signs of caring and love from his mother, are important in his healing. Questad: I agree that it is our role as mothers to pass down family values and culture. But perhaps the Inuit way, geared to prepare a child for survival in a harsh world, is to let go so that the child discovers his/her own path –in effect, finds and develops the inner core, the inner strength, that will carry him/her forward in life. In this way, when I compare it to middle-class American parenting and governmental supports, I wonder if over-protection and our hovering over our progeny doesn’t create a more dependent, less fulfilled society. Anderson: I agree with your thoughts about that and the dependency issue. But remember, Bev, in the film help fortunately comes from the police and a social agency which care enough to intervene. Inuk really can’t survive on his own. Few people really can. Since there is some amount of neglect by his alcoholic mother, it is the state that moves in to provide the support. So that intervention is needed. Questad: That reminds me that in the classic model of the hero on a journey to find and realize meaning and purpose in life, guides and helpers are crucial to success. Anderson: Yes. We can’t always do it on our own. Ikuma, the seal hunter, becomes Inuk’s mentor, even though he is a broken person too. Ikuma is on a pathway to rectify his past. He is from Inuk’s original northern area in Greenland. He is able to give Inuk insight into the death of his father as well as his mother’s courage in saving Inuk’s life. But I still don’t understand why his mother was not better able to provide a home for Inuk after the father died. Questad: You are puzzled about the mother and the way this woman is depicted in the film. This is the one part of the film you’re not buying. I sense you feel a dishonesty or manipulation in the story here. Maybe it is because this literally happened to you. When your son was around 9 or 10 your husband died of a heart attack. There is a grief too personal and deep to touch, but as a woman away from the support of her family, you rose up in strength and resilience. So let’s look at the mother figure metaphorically in this film. Maybe the writer thought an exaggeration was necessary to drive home the point that it is only when we leave our dependence on our parents that we are able to develop our own self-reliance and embark on that universal journey to an actualized self. Anderson: Yes. But I still am working on the issue with the mother. She declares she can take care of her son, but she cannot. She herself is a broken person. In the harsh environment she cannot give her son the skills he needs to survive. It is a man’s world there and Inuk needs a man to show him the way. It is a harsh world for this woman, too. With little education, preparation or power to make a life for themselves women find it hard to make it alone. Questad: I think you’re right. Everyone in the film has difficult, complex challenges. 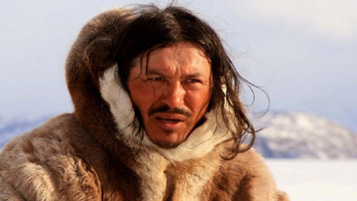 From film reports, “Inuk” was not far from reflecting the reality of the crew either. Shot on sea ice in -30 C temperatures, the remarkable cast featured teenagers who are also residents of the Uummannaq Children’s Home playing roles close to their real lives. Widespread release set for January 2014. This is Bev Questad’s first collaboration with Ardelle Anderson. They both recommend this film as one that will resonate with viewers of all ages on several different levels. Thank you Beverly for the beautiful article. We will indeed keep you posted on the January screening schedule. As of today everything starts in New York (the Quad), Anchorage and Fairbanks (the Regal Cinemas) on January 24th. Many cities are still being booked for that day and the weeks to follow. Thank you again for the support.